The “perky pinhole.” Yes, it really works. The other evening I saw some very beautiful work that a friend made using the Holga wide-angle pinhole camera. Still, I can’t help finding it preposterous that a hollow plastic box should cost almost sixty dollars. The whole beauty of pinhole cameras is that they’re so simple anyone can build one for themselves. All kinds of designs are possible, and Flickr’s Homemade Pinhole group will give you more inspiration. The only possibly-tricky aspect to building a camera is poking the pinhole itself, but my own how-to instructions should get you over that part if need be. As part of my new Camera-wiki.org activities, I had a chance to completely revise our wiki article “Pinhole camera,” and add a new one, “Homemade pinhole camera.” The second article gives some general design guidance for pinhole cameras, but isn’t a step-by-step project like my posts here on Silverbased. A few folks have seen the Pin-O-Rama design I did for MAKE magazine a few years ago. This is a pinhole camera which wraps 120 film around a curved film gate, giving an image 6×12 cm and more than 100° wide—the resulting photos are pretty entertaining. For some mysterious copyright-violating reason, the entire article is available as a PDF file here. But be sure to check out the errata on MAKE’s talkback page. But whether you build something from scratch, hack up some old unused camera, or just go buy one of the commercial pinhole cameras now on the market, I hope this year you’ll give pinhole photography a whirl. Today’s post is for folks who are just getting interested in pinhole photography—whether you’ve heard about it as a fun DIY project, or as a creative technique for producing evocative, dreamlike images. Pinhole camera designs can be incredibly varied. The traditional scout-troop model was built from a Quaker Oats carton, exposing a single sheet of photo paper. But “single shot” pinholes are a bit inconvenient, especially as fewer people have access to a darkroom these days. But I’d like to give a little background that applies to all pinhole cameras, of any form. Then we’ll look at a method for fabricating the all-important pinhole itself. So why does a pinhole camera work? Imagine a light-tight box, with a piece of film on one side and a tiny hole in the other. Each point on the film can only “see” one patch of the outside world, the one lined up with the pinhole—whether it’s light, dark, blue, red, etc. So an image of the scene forms upside down on the film. With that idea in mind, visualize what happens if you move the pinhole closer: The angle from the film corners to the pinhole gets more oblique, and the camera takes in a wider view of the outside world. So How Large is a “Pin” Hole, Anyway? Up to a certain point, the smaller the hole you use, the sharper the image you get. But if you go too small, you run into a problem with diffraction—the tendency of light waves to fan outwards when they graze the edge of an obstruction (it’s a problem for lenses, too). Thus, there is one hole diameter for any given focal length which gives the optimum possible sharpness. Historically, a number of great scientific minds labored to derive the proper formula to compute this. But today, you can just put your faith in a handy online calculator, like this one from Mr. Pinhole. For typical cameras the best diameter works out somewhere between 0.2 to 0.5 millimeters—equivalent to an f/stop of f/100 to f/300. This definitely implies some long exposure times might be needed. But everything from infinity to inches away will be recorded with equal sharpness. If you want a camera covering a particular angle of view, you have a choice between using a small piece of film with a short focal length, or building your camera using a bigger image format and a longer focal length. For example, a 30mm focal length on a standard 35mm film frame gives the same coverage as a 225mm focal length exposing an 8×10″ sheet (both show about 72° diagonally). But which is better? 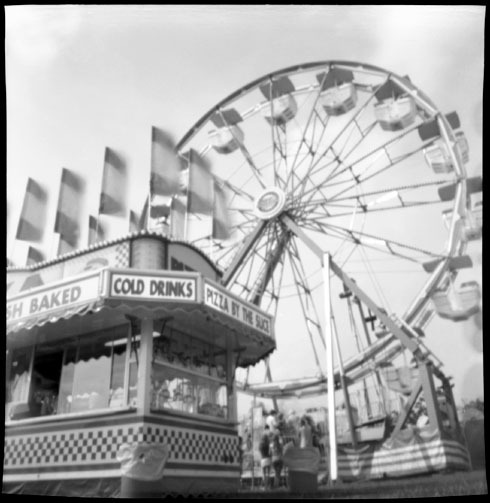 My own conclusion is that 120-film pinhole cameras offer a good trade-off between image quality and film-handling convenience. How Do I Make a Pinhole? The goal in fabricating a pinhole is to get one that is nicely circular, without ragged edges, and whose diameter you have at least roughly measured. You’ll probably do best by piercing your hole in the thinnest possible material. If your pinhole more resembles a microscopic “tunnel,” oblique light rays will be blocked and you’ll get noticeable vignetting. While that effect can be interesting to explore, you’ll likely also see problems from light reflecting off the inner walls of the hole, degrading contrast. 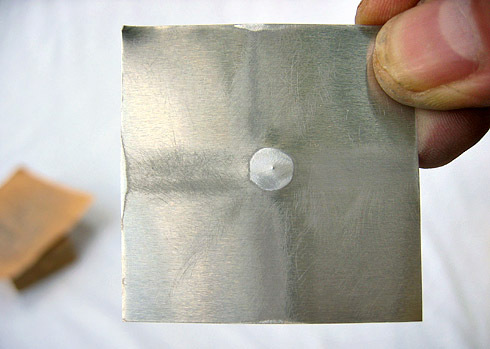 While it’s fine to experiment with tinfoil or the side of a beer can, I settled on a method for fabricating pinholes in aluminum roof flashing (about 0.01″ to 0.02″ thick). I just find it more secure to fasten those flat, stiff sheets into whatever camera I’m building. First, start by cutting squares of metal 50mm on a side. Why 50mm? Because it’s the same size as a 35mm slide mount—this may come in handy when it’s time to measure the pinhole diameter. Cut several extras, since there’s often a bit of trial and error in achieving your target pinhole diameter. Place the metal square onto a piece of softwood, and tap a small dimple into the center. 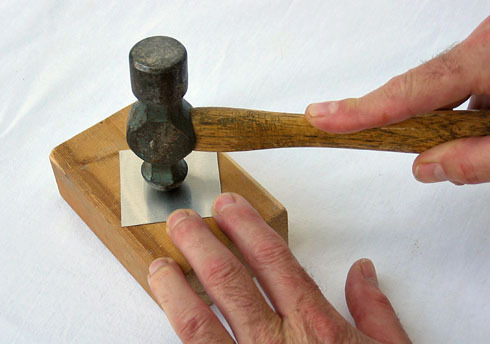 A ball-peen hammer works fine; however it might be easier to center the dimple if you hold something like the rounded head of a carriage bolt against the metal, then strike that with the hammer. The dimple only needs to be high enough that you can selectively rub that spot against a sheet of sandpaper to thin it. Press and sand the bump against fine sandpaper—320 or 400 grit works well. 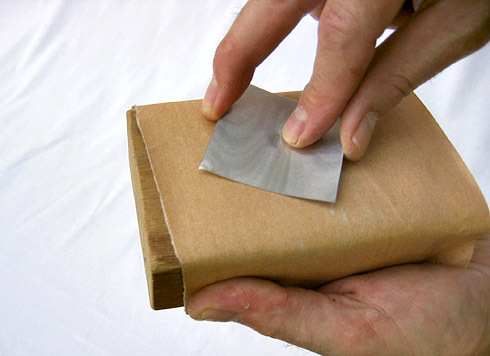 Here I show the sandpaper wrapped around a block of wood, to make it easier to hang onto; flexing the edges of the metal backwards will help avoid sandpapering your fingertips! You want to rub with enough pressure that you’re definitely removing metal, but not so aggressively that you sand right through. After a noticeable flat spot has formed, it’s time to start checking your progress. 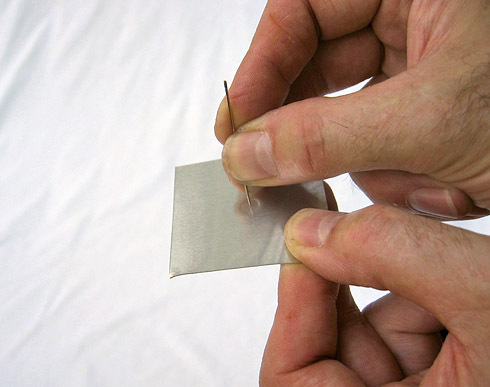 Gently press the tip of a sewing needle against the hollow of the bump. You are not trying to push it through yet—hold the needle by the sides to avoid applying too much pressure. What you are testing is whether the metal is thin enough so that the tip of the needle telegraphs a tiny raised point through to the other side. If not, go back to the sandpaper and rub a bit more, then test again. With your first test, you probably left a small pin-prick in the metal. Keep placing the needle in the same spot after that, to avoid inadvertently forming multiple pinholes. Take a couple of light strokes against the sandpaper to flatten the raised point. Now hold the metal up to a strong light—it’s possible that a tiny hole will show through already. But in any case, you’re getting very close. Press the bump against a firm backing, like a telephone book. Replace the needle tip into the pin-prick you started, then give firmer pressure, pushing on the end of the needle as shown. You are not trying to push the needle through the metal—the diameter of its shaft is much too large. With gentle pressure you’re just trying to to push the point of the needle through. Once you “see daylight,” go back to the sandpaper and lightly sand away any rough edges around the hole. Take the tip of the needle and very gently spin it in the hole to help round off any irregularities. Blow through the hole to remove any dust from the sandpaper. Now It’s time to check if your hole looks clean, round, and what its diameter is. Simply put the pinhole metal into the scanner, and scan at the highest available resolution. (Only scan a small selection around the hole itself, to avoid ridiculously bloated document sizes.) Either scanning the hole on a flatbed document scanner or with the slide holder of a film scanner is fine—although a film scanner may offer higher resolution. 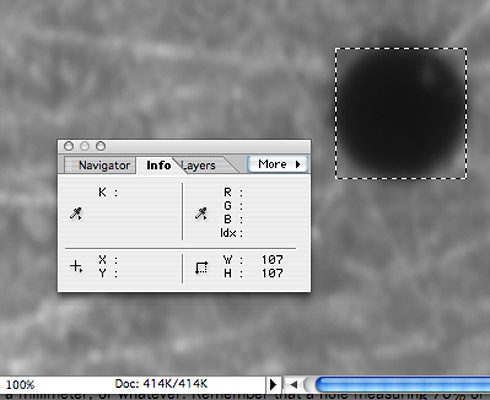 Some photo-editing software has a ruler tool allowing you to measure sizes directly. But even in a more basic program (like the old version of Elements shown here), you can still measure the hole. Drag out a selection which just barely encloses its image; then open the “info” palette to read off the size. To get the most accurate measurement, I suggest going into the preferences and changing the default units to pixels. If you scanned the hole at 9600 dpi, and your selection is 107 pixels across, its diameter equals 107 divided by 9600, or 0.0111 inches. 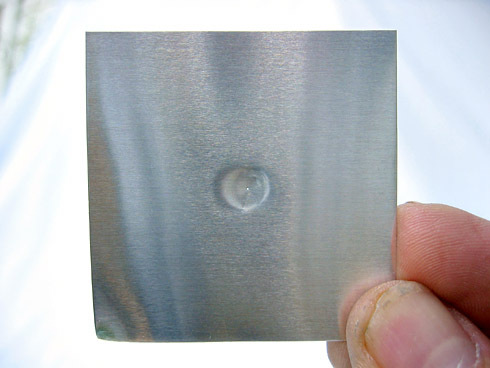 There are 25.4 millimeters in an inch, so that pinhole size translates to 0.28mm. Personally, I find there is a lot of trial and error in achieving at a nice clean pinhole of the correct diameter. So I will often make a batch of pinholes at the same time, to get one good one. In that case, the scanner method becomes a little time-consuming. The key thing is to know that the opening of a standard slide mount is about 23x34mm. 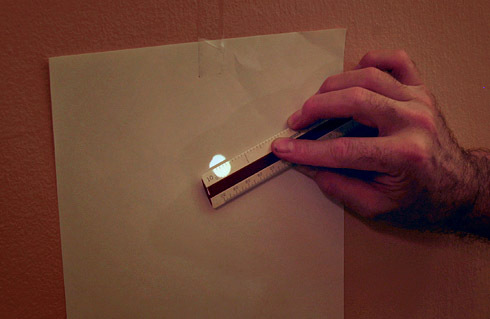 From the height of a slide image projected onto the wall, you can calculate the magnification; and from that, you can figure out how large the spot of light would appear from a properly-sized pinhole. But I have an even simpler trick: Move the projector back and forth until a complete slide is projected at a size of 46 by 68 inches. At that magnification, every inch of the projected image represents 0.5mm at the slide mount. Thus you can read off pinhole sizes very rapidly (a ruler divided into tenths of an inch is helpful). If you discover you went wildly over your target pinhole diameter, start over with a fresh piece of metal, but try to press more gently with the needle this time. And don’t throw away the “bad” pinhole. 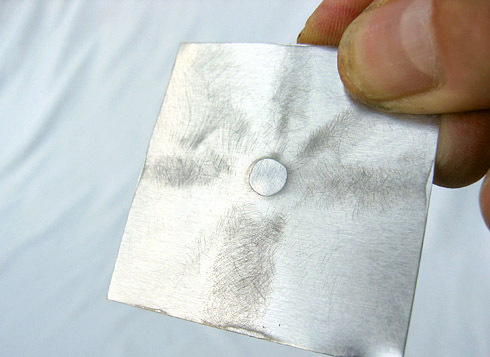 Just write its diameter onto the metal using a permanent marker, and hang onto it somewhere. Building pinhole cameras is rather addictive; a day may come when you create another one needing exactly that diameter hole. Figuring pinhole exposure times means knowing the equivalent f/number. 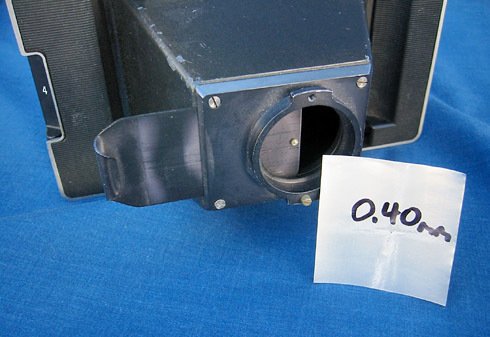 This is simply the focal length of your pinhole camera, divided by the pinhole diameter. (But both need to be expressed in the same units, whether millimeters or inches.) It’s preferable to avoid f/numbers under f/100, just because the correct exposure in full sun will be a fraction of a second—not something most homemade pinhole shutters can time accurately. When you need to calculate exposure times, few light meters will indicate f/stops all the way into the hundreds! So it’s helpful to know that f/128, f/181, and f/256 are exactly 6, 7, and 8 stops smaller than f/16. Find the indicated exposure time at f/16 and count off the steps to the correct (longer) time needed for your pinhole exposure. 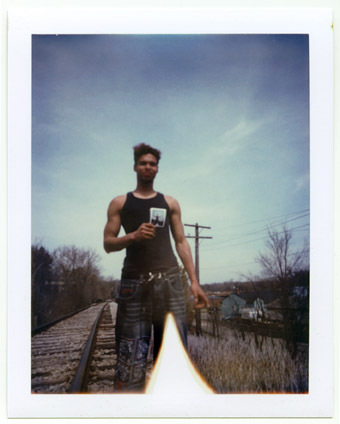 Sadly, we are all counting down the days now, until Polaroid stops making all their instant films. But in the spirit of savoring our Polaroids while we still can, recently I bought some type 669 film packs. These peel-apart films are an older technology than Polaroid’s “integral” types like 600 or SX-70 Time-Zero. But the peel-apart pack type was adopted for so many professional and technical uses that demand remained high until digital arrived. So there are several packfilm emulsion types still available. Even Fuji has now started making a line of compatible film packs. I’m skeptical that another manufacturer will start up making Polaroid’s integral films: It’s a much more complex technology (each pack includes a unique flat PolaPulse battery). But it’s nice to feel I’ll have the Fuji backup option, if I end up falling deeply in love with my pack-film projects. Anyway, as I mentioned, I was never that fond of Polaroid’s own cameras. This started me thinking about “alternative” ways I could expose images onto 669 film. 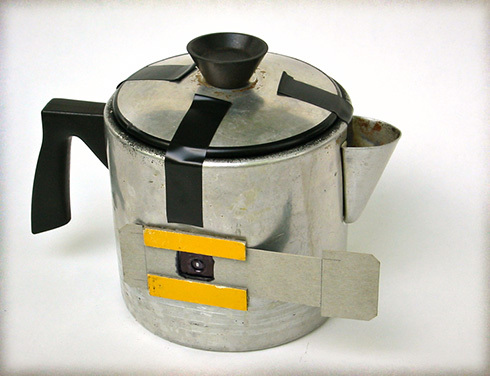 So today I’ll show the first of two Polaroid camera hacks: The PackPola Pinhole. But, oh all right—if you insist on making things more complicated, here are some additional details. 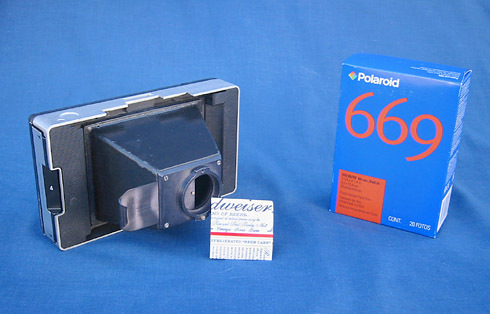 While most of the later pack film cameras were plastic-bodied, Polaroid did manufacture a stout cast-metal body which was used for certain products—in complete cameras, or as a dedicated Polaroid back for technical uses. 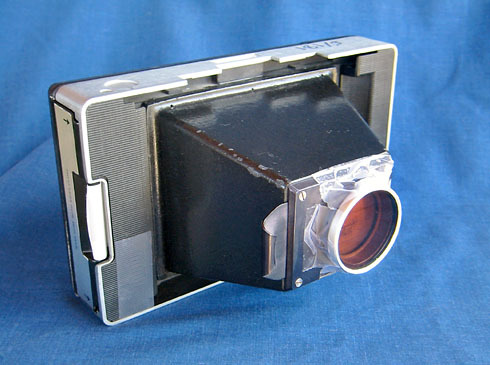 The model shown (which I was told was a microscope camera) has a rigid cast-metal “pyramid” where a civilian Polaroid model would have bellows, with a custom attachment flange on the front. Now you could build a Pola-pinhole by hacking a regular bellows style camera too—and these models are practically being given away today. You’d need to remove the front of the lens/shutter assembly, and attach a pinhole behind the bare lensboard. (See the excellent step-by-step disassembly photos here—also getting a chance to practice your Italian!) But in that case, you would need to improvise a shutter, and the focal length will be about 30mm longer (and hence less wide-angle-y) than with the microscope camera. For that focal length, the optimum pinhole diameter is roughly 0.4mm or 0.015 inch. This equates to a pretty tiny f/stop: the nearest whole stop value is f/181. That’s 7 stops smaller than f/16—useful to know when trying to translate light-meter readings into pinhole exposure times. 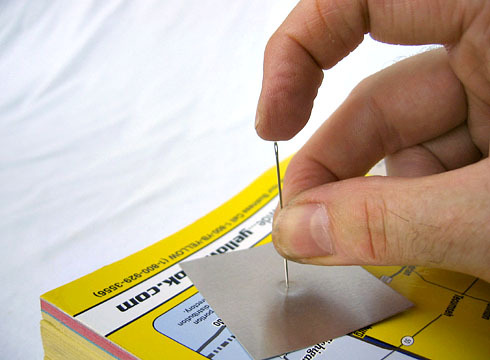 Back up your pop-can metal against something firm like a phone book, then just barely pierce the metal with the tip of a sewing needle—don’t poke all the way through! Sand away any rough burr around the edge of the hole using fine 320 or 400 grit emery paper. Twirl the needle tip in the hole to smooth any raggedness—you want the hole to be nice and round. You can measure the diameter of your pinhole exactly, by placing it on a flatbed scanner and scanning at the highest possible resolution. Knowing the exact DPI of the scan, and reading off the dimensions of a selection just including the hole, you can see if its diameter is in the right ballpark. I often start with a bunch of metal blanks of 50mm square, a size that will fit inside a cardboard 35mm slide mount. By setting up a slide projector at a known magnification, I can quickly go back and forth between checking sizes and roundness and gently enlarging holes with the needle to reach the desired diameter. 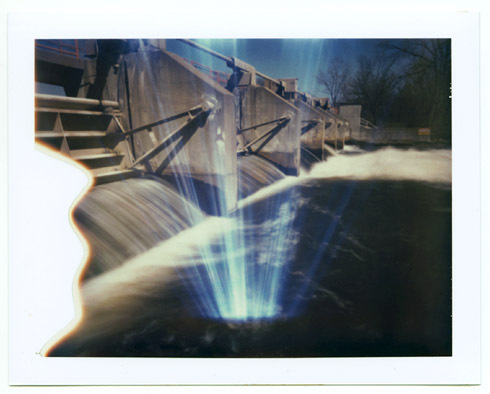 Of course, one great advantage of a Polaroid pinhole is that you can just wing it. Try an exposure at what you think your equivalent f/stop is. If it’s too light or too dark—next time use a revised guesstimate of your f/number when you figure the exposure. You might enjoy this effect—or, you can tape a warming filter in front of the pinhole. In direct sun, start by trying one of the #81 series filters. But for longer exposures or in cooler light you may need a stronger orange/salmon colored filter, like one of the #85 series. If you can get your hands on a swatch-book for theatrical gels (like Roscolux), that would offer a huge range of colors to try (with pinhole work, you’re not exactly worried about the optical flatness of the sheets). Personally, I raided my cache of oddball Series VI filters, and found a perfect Harrison brand color-correction filter, designated “C3.” This filter loses a little less than one stop of light; I used exposures of about 3 seconds in full sun, up to 30 seconds in darker shade. The color palette of 669 seems to give a nice pastel softness, thought without much saturation in the reds & yellows. If you have never used pack film before, you may be flummoxed by the profusion of weird tabs that sprout from the end of the camera (from a slot helpfully labeled “4″). This becomes easier to explain when you understand that pack film is actually negative and positive sheets stored separately, which need to be sandwiched together to start development. The first black tab pulls a light shield out of the way, and uncovers the top negative sheet. After you make an exposure, pulling a white tab slides the exposed negative around into contact with the positive print paper. However both are still dry at this point, and nothing happens yet. Pulling out the wide arrowed tab bursts a pod of chemical paste, and the two chrome rollers smoosh a uniform layer of this goo between the positive and negative, starting development. After 60 seconds, the image is fully transferred and you can peel the print away. It stays a little tacky for a few moments, so don’t accidentally get it stuck to another print. I discovered pretty quickly that my microscope camera pack-holder had a couple of quirks—possibly the reason why it had been retired and discarded in the first place. The first is that its rollers seemed to have gotten tired, and weren’t spreading the developer goo all the way to the far edge of the print. But actually, the white blobs caused by this were one of those serendipitous creative accidents that I ended up liking. The other issue was that there was a serious light leak somewhere in the camera body. Now, remember that a pinhole (like a lens) forms its image upside-down. So this radiant splash of light at the bottom of the print was coming from somewhere on the top of the camera. Eventually I realized there was a tiny gap at the seam where the pyramid cone attached to the film back—perhaps the camera had gotten dropped once. A bit of electrical tape fixed that up. 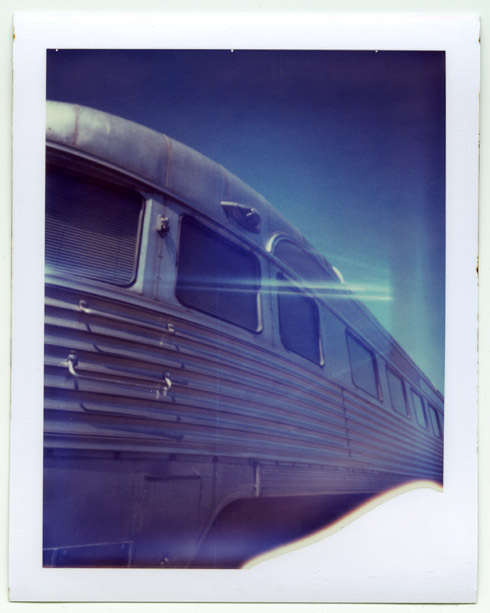 But as light leaks go, this may be one of the more beautiful ones I’ve seen!